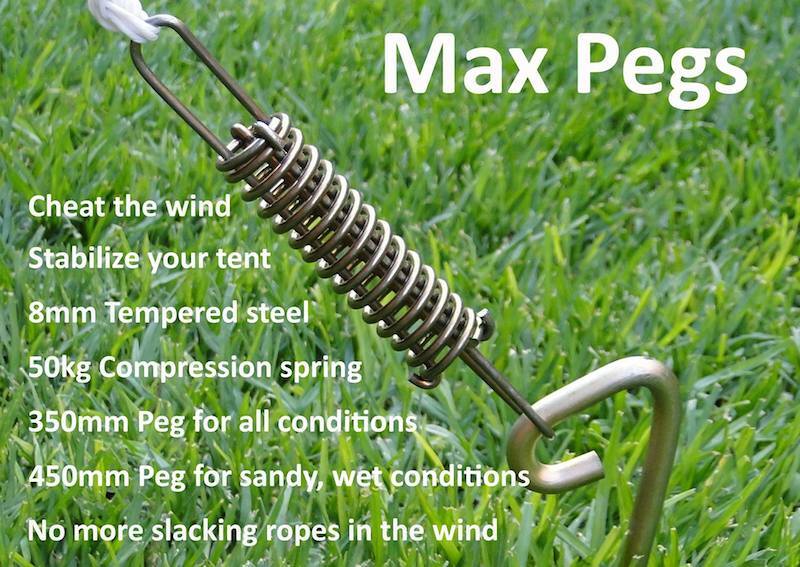 Max-Pegs | Max-Pegs replace the traditional L shaped anchor tent pegs. Max-Pegs TM replace the traditional L shaped anchor pegs. Instead of 1 peg, we have 2 components namely a 8mm thick hardened spring steel peg and a compressing spring capable of 45kg of resistance. Max-Pegs TM are quality guaranteed, if one of our components break with normal use we will replace it for free. Read how to setup Max-Pegs TM . Watch Max-Pegs TM video tutorials. When you hammer the pegs, you are basically hitting the spring section of the peg, the hammer “hops” on the peg, hence not every strike counts to get the peg into the ground. 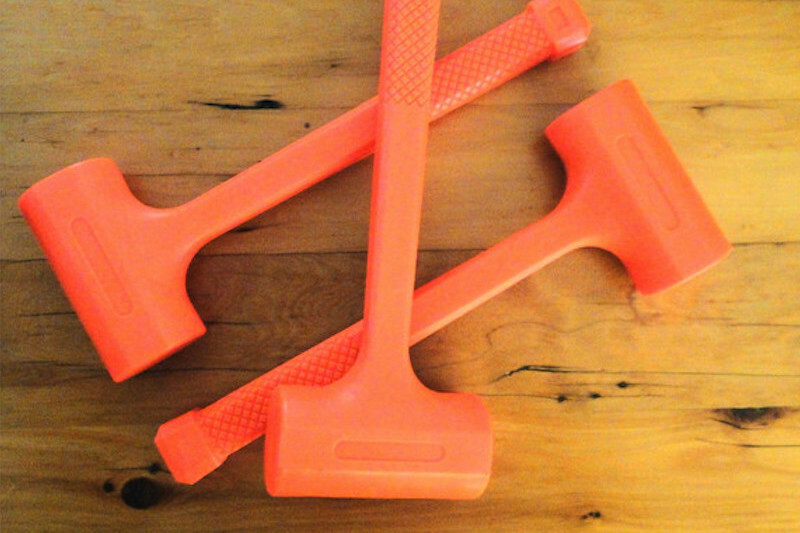 The hand holding the peg at the end of the “L” portion gets hurt with the vibration created by the hammer blows. 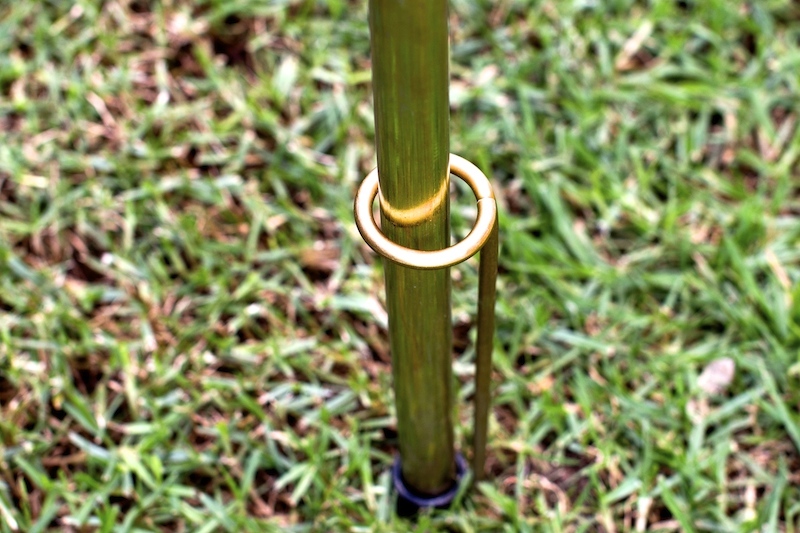 When the ground is hard the pegs are likely to bend as they are only 5mm normal spring steel. The vertical spring action of these pegs which is supposed to hold your ropes tight is very limited. 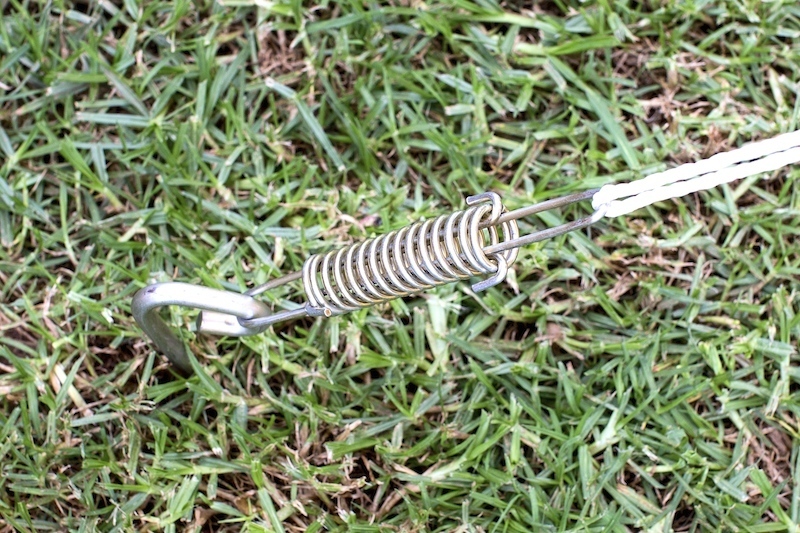 The mechanical reaction to the spring action of the “L” peg causes the anchor portion to work itself out of the ground after a day or two in windy conditions, hence you only have a temporary anchor, and you have to periodically inspect them to ensure that they are still embedded. 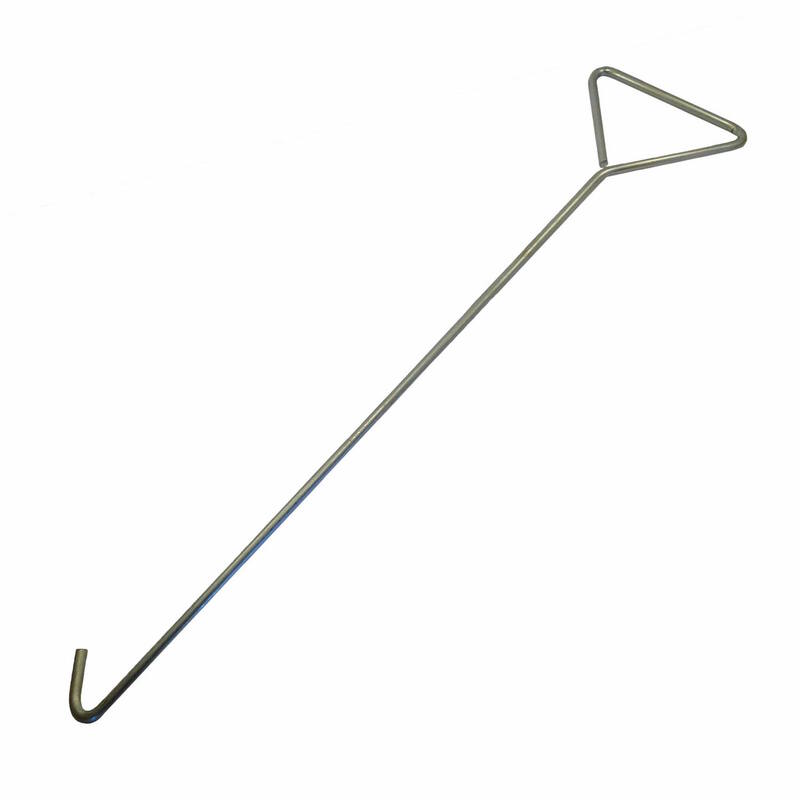 “L” Pegs are temporary spot anchors and offers no counter action from the other “L” Pegs around your tent. This causes the guide ropes to unhook, causing total collapse of the structure. 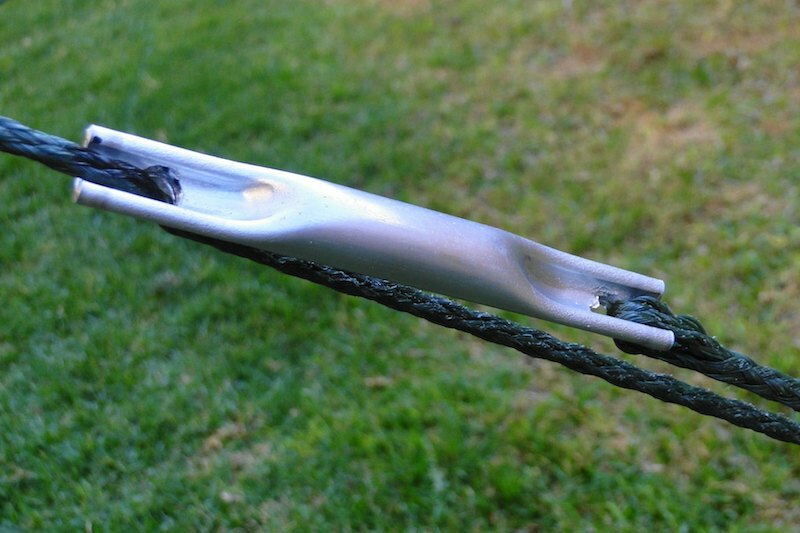 With a slack guide rope that has not unhooked itself from the peg yet, and the wind suddenly swirls, creates a “snap” action which will cause your tent to tear. 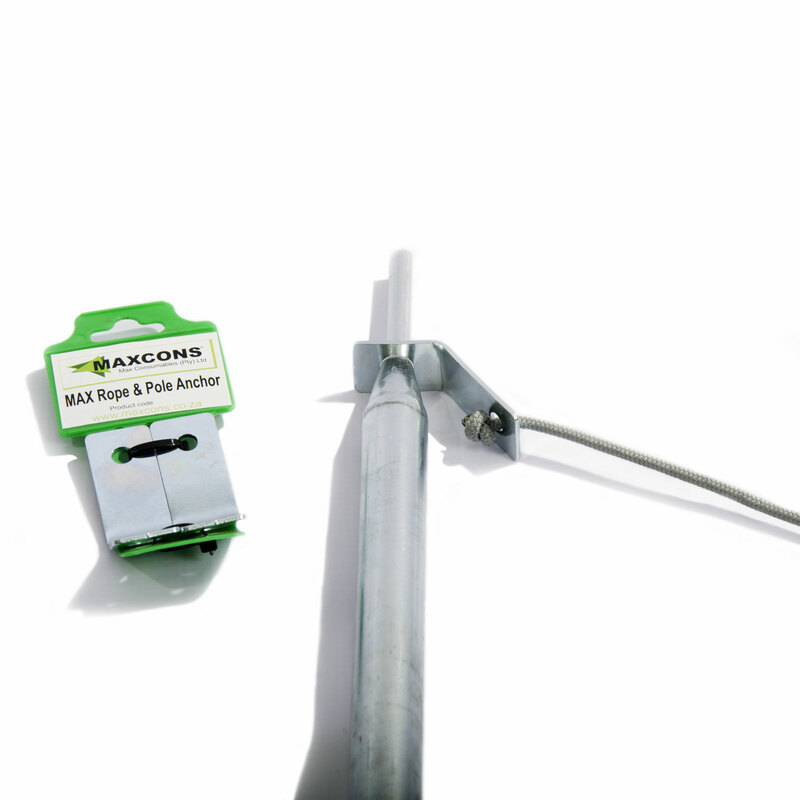 The anchor pegs are made from 8mm hardened steel and are 350mm and 450mm in length, perfect for hard and soft ground conditions. The head of the peg is designed in such a way that you strike it virtually right on the shaft, with the result being that you don’t have any “hammer bounce” action and each strike counts to getting your peg into the ground. 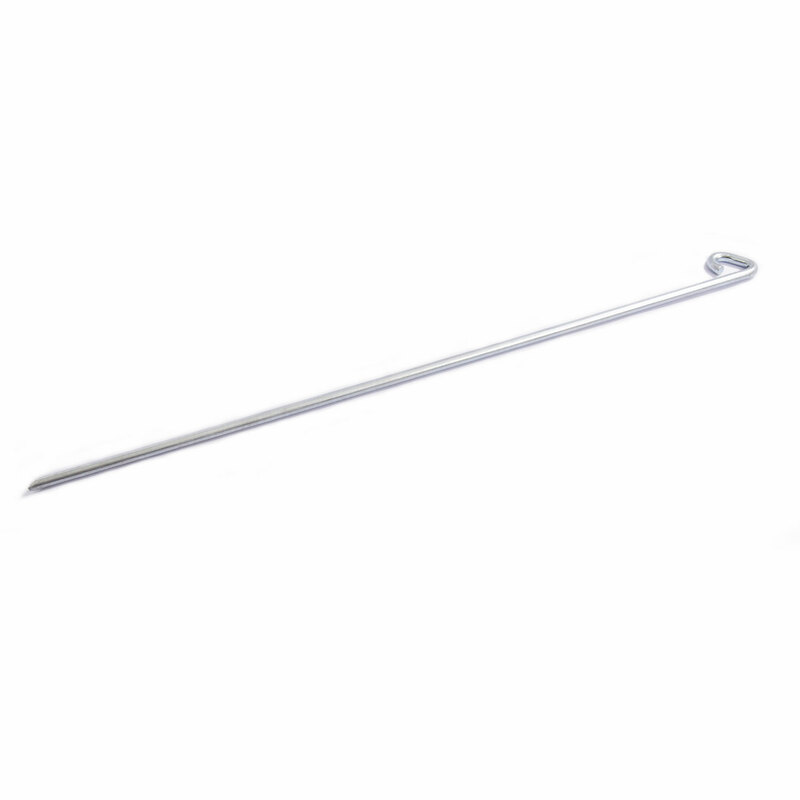 The head hook is designed in such a way that it is a system of closed loops and when the spring is hooked on, the rope and spring cannot unhook itself in any windy condition. 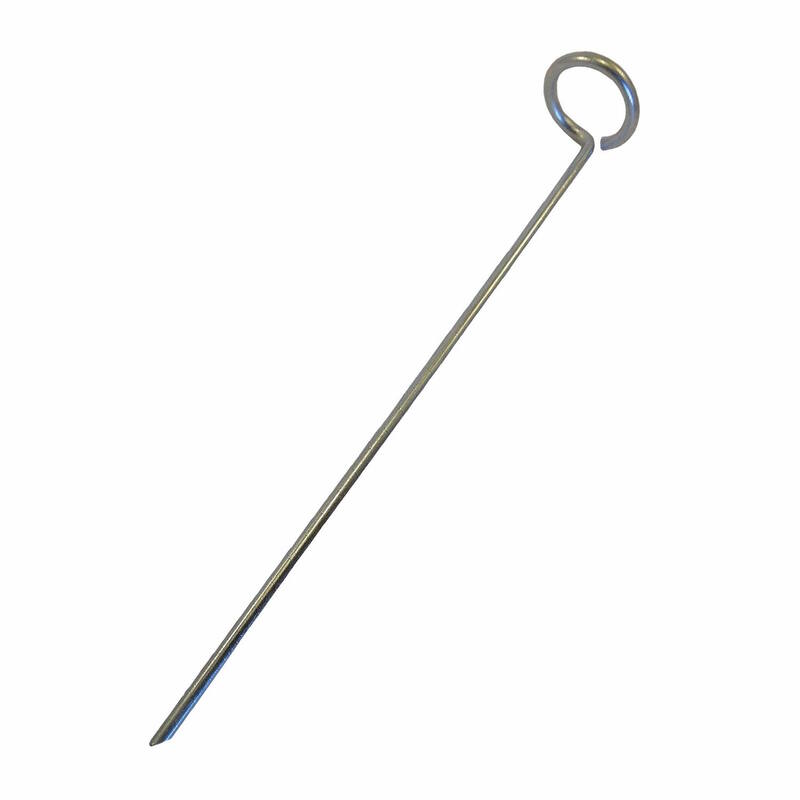 With this peg and spring we have addressed all the anchor issues and the spring action cannot work the anchor out the ground, you now have a solid fixture which works and is easy to assemble. When the springs get pulled up with your guide ropes, the tension on your seams and poles is proportionally spread as all the springs have the same strength. You can only pull a spring half of its length with your hand strength which leaves enough spring action should the wind come up. 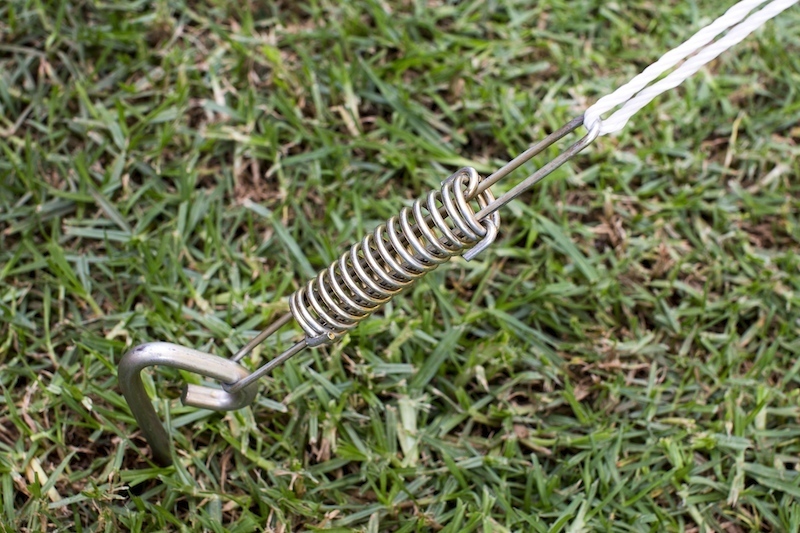 A compression spring’s push and pull strength gets progressively stronger as it is being pressured. Since each spring is working against one another to get back its original form, it holds your tent firmly in place. If a strong wind comes from one side of the tent, the springs on the “wind side” contract and the springs on the opposing side will release immediately and hold the tent firmly in place. If the wind suddenly changes direction, the reaction of the springs is immediate and their whole action changes to the side that the wind is coming from. The ropes cannot be detached and the springs cannot unhook from the pegs. 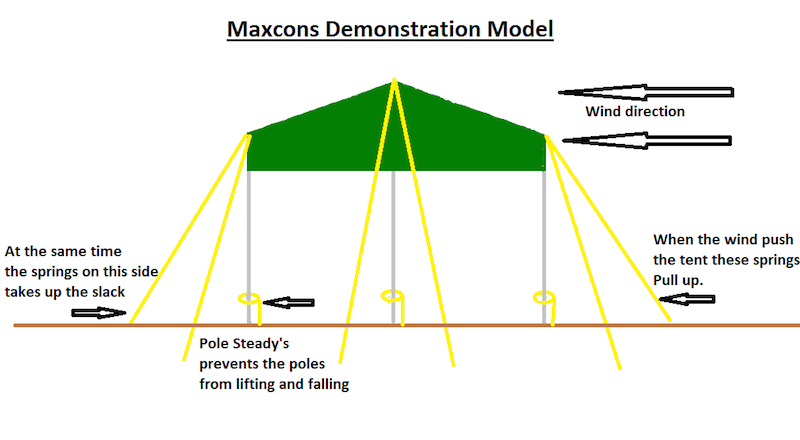 This is basically an “inverted suspension” system for your tent. 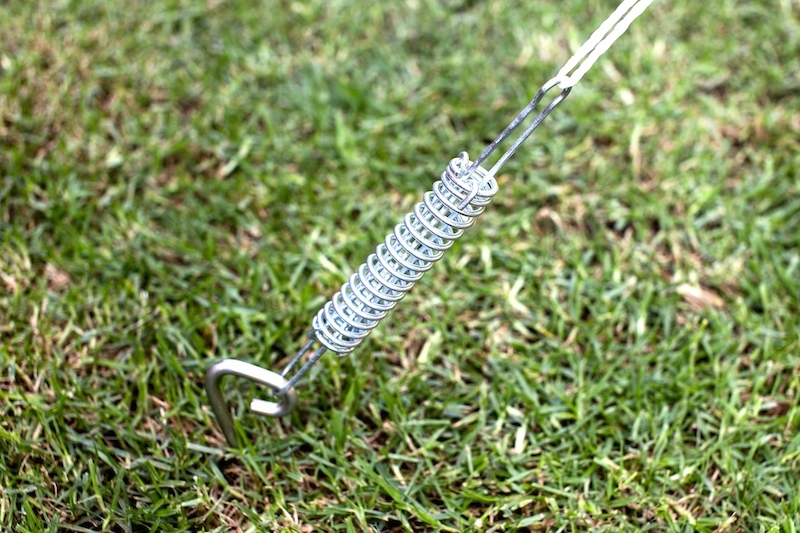 The spring action on every peg prevents any “snap” action experienced with normal tent pegs that would tear the tent and bend the tent poles. A tension spring loses its memory. To acquire a similar amount of power, you will need to get a bigger spring. Tension springs will need to be replaced regularly. We use a compression spring of the highest quality. This spring does not loose its memory.